Where little bits of Acro happen. Welcome to Acro Sheffield’s virtual home. We are a friendly group led by Duncan Cosgrove that specialises in maximising fun while defying gravity. We meet on Tuesday evenings to practise and share skills at Croft House and arrange adhoc meet-ups especially when the sun is shining. Beginners are always welcome to attend for an introduction to Acrobalance with no need to bring a partner. Acrobalance is the combination of the two athletic art forms, Adagio lifts / Hand balancing and partner acrobatics. 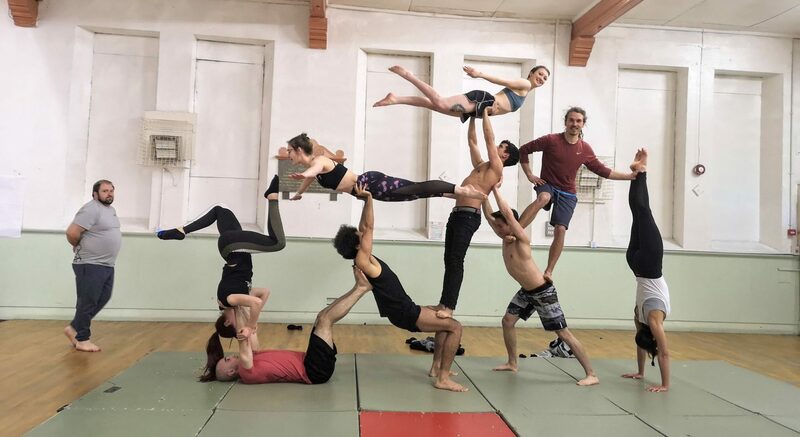 There is usually at least one base ( Supporting or Lifting Role ) and always one or more Flyers ( In the lifted or balanced Role ) but sometimes that can mean 3 Bases to 7 Flyers or a Big base holding a Base holding a flyer. There aren’t really any strict rules and creativity beats tradition. What is certain is that it improves strength, flexibility, coordination, balance, proprioception, confidence and a myriad of other attributes but best of all it is lots of FUN.